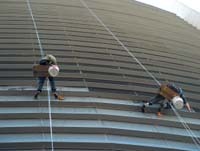 Rope access or Abseiling is increasingly used in window cleaning. For any window cleaning task an assessment will be made to establish whether rope access is an appropriate method for the work. For all work at height, the most intrinsically safe means of access will always be our first consideration. All operatives will have received training in rope access work and have the appropriate knowledge, experience and practical skills for the type of work being undertaken. Training has been carried out by a competent organization such as IRATA, and includes assessment of specific skills and knowledge. For window cleaning companies to carry out rope access operations safely, it is essential that they are competent for a specific technique.